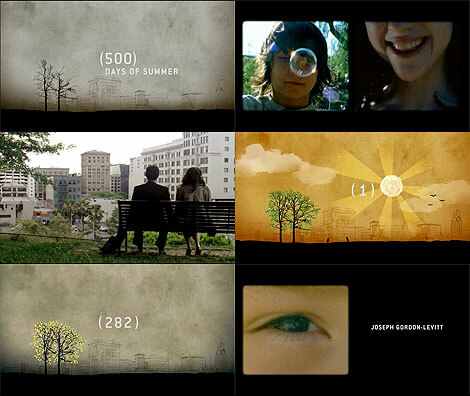 A story of relationships, expectations and destiny, (500) Days of Summer is one of my favorites. After reading good reviews about the movie I drove to Lethbridge to see this one in the theater because it never did show in Medicine Hat. The title sequence is equally rich in contributing to the movie. I love the fact that the title sequence could have many interpretations. At first glance it could easily be understood as a love story of a guy and girl, destined to be together as kids. But at second glance and understanding the movie the title sequence becomes Tom's (the main character) story of how he imagines this relationship. It becomes Tom's fantasy that they were destined to be together, leaves growing on the trees, childhood parallels. But then parts of the sequence become disjointed like there was a reason that Tom and Summer are supposed to meet, but not in the way that we or Tom expects.